If you want an even lower-level mechanism for drawing text than provided by DrawingContext.DrawText, you can use DrawingContext.DrawGlyphRun. DrawGlyphRun lets you draw text based on glyphs, which are individual characters within a font that typically represent a single character in a language. 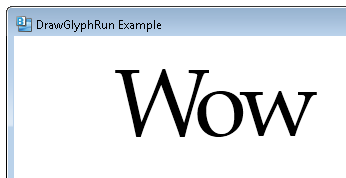 Below is an example of rendering the word “Wow” using DrawGlyphRun, in a custom DrawingVisual. The glyphIndices parameter specifies a list of indexes into the font for the glyphs that are to be rendered. In this case, BeginInit() and EndInit() are not required, is this correct? Thank you.